I’ve actually been back for ten days now, and it’s taken me this long to get my act together and upload my favourite photos, let alone open up the “write” tab in wordpress. The belated honeymoon holiday was sublime and I wanted to blog about it, really I did. But ever since I got home I’ve been fighting back waves of quasi-constant nausea and enduring more than my fair share of insidious, light-sensitive headaches, with the result that I’ve been pretty exhausted and have spent my days doing more sleeping than anything else. And all because I found out, on the eve of our honeymoon, that The Boy and I are expecting a baby. It’s early days to be making any sort of announcement, I realise, but I weighed up the pros and cons of coming clean and decided that if anything were to go wrong, god forbid, I’d want to be able to write about it here, so I see no real reason to hold back. I’m 7 weeks in – counting from the beginning of my last cycle, as there are, it transpires, different ways to count – and the automated email that popped into my inbox this morning tells me that the embryo currently resembles a very small Tadpole, which I thought rather fitting. Many congratulations to, well, everybody. Even the skateboard! Awww Petite….Congrats many times over! Your world just seems to get better and better. First of all, congratulations!! I know that you don’t know me, but like so many I’ve now read so much about your life that I feel like I know parts of you, so I cannot help but feeling a little bit “pregnant” along with you. I need to tell you that I owe you a “thank you”. You have inspired me, and therefor you have offered me help, without knowing it. First I found your book on an ordinary shopping trip to ASDA, and from there I found my way to your Blog… and as a result I have now started my own. I’ve always written little bits, but have never quite known what to do with them. Through your book, I have found a wonderful outlet for my own little bits of creativity (although I would never dare to imply that my writing comes anywhere near the standard of yours!). Thank you so much for your wonderful writing, and for your honesty. You are a very brave woman to let people look into your soul as you do. I wish you all the best in your marriage and hope you will have another very healthy and equally cute little Tadpole(her singing is just the sweetest thing). I hope you will keep up your Blog for a long time to come, and I’m already looking forward to your next book. Congratulations Petite! It sounds like you will have lots of interesting things to write about in the foreseeable future. Bon Chance! Woo-hoo! Welcome to second-time motherhood. Enjoy this little “honeymoon period” while it lasts — two kids are a handful. so i take it congratulations are in order. hope everything goes well. Congratulations! And best wishes to you and your growing family! Congrats! I recently found out that I am expecting my first baby (half-French too), so I am excited to see your upcoming posts. I can already relate! Well, congrats! Hope your next tadpole will be a cute as the original one! What a delightful, and somewhat appropriate surprise for a belated honeymoon. You are completely forgiven for not updating sooner and for just about anything you wish for the next nine months. I do not know whether it is more appropriate to say “bon chance” or “bon courage,” so I will just say congratulations! Hope I’m the first (on here) to say CONGRATULATIONS! OMG!!! Congratulations!!!! That is absolutely fantastic!!! Can’t wait to hear more – and what better reason to keep us all entertained by blogging more often! How does Tadpole feel about becoming a big sister? This is fantastic news – congratulations to both of you. Big congratulations!!! PS – can you set up a bloke’s version of the site where you don’t talk about ‘cycles’ an’ all that? Just the ‘there is a baby’ bare bones stuff will do. I really symphathise about the nausea and migraine-like symptoms of early pregnancy. Try those acupressure bands for seasickness, they might give you some relief..
Be careful about dehydration, it can make migraines worse. I know it’s hard to keep sipping water when you feel so queasy, but it’s important not to get dehydrated. Hope you start to feel much better soon! It begs though the question, though – what exactly WERE you doing on the skateboard then? What lovely, lovely news — congratulations! I came here a few days ago after reading your book, and spent a few hours one evening catching up on your story since the end of the book narrative. What an amazing new beginning for you! Oh wow! That’s absolutely wonderful news! Congratulations! 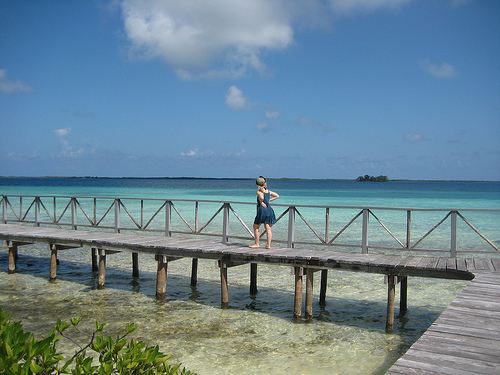 I added Belize to my places-to-visit list after seeing those photos… so gorgeous. Congratulations on the baby! It’ll be very exciting to read about it as the months progress. Congratulations! Glad you managed to hold off on the sickness until after your holiday. Am a new ‘convert’ to your work and enjoying it so much. Glad you had a lovely honeymoon as well. Congratulations, Petite. That’ll give you plenty to blog about! Congratulations! Here’s hoping you have a healthy pregnancy! Looking forward to hearing more of Tadpole’s reactions to your pregnancy and the new sibling! I have followed this blog for 4 years now, and felt compelled to comment. Sincere congratulations, it’s wonderful news. I hope that you can share it with us! Looking forward to the posts already. How wonderful! Congratulations to both you and The Boy. Congratulations! So happy for you…can’t wait for the next chapter. Waow, that’s just great ! Long time no news, and then this. Congratulations ! Congrats! What will this one be called, I wonder? Polliwog? When I was reading how you were feeling I was going to comment – are you certain your not pregnant? – but low and behold the next sentence told me that hunch was right! when you mentioned nausea and lightheadedness, i immediately thought you must be pregnant. such wonderful news! a new tadpole :) congratulations! fantastic pics from yr honeymoon btw. #48 – Mike, spawn sounds a bit too horror film for my liking. Will have to mull this one over. Always knew skateboards were dangerous! Congrats! aw congratulations!!! such wonderful news! i look forward to hearing all about it! A huge congratulations to you, The Boy and Tadpole! I’m totally over the moon for you and the Boy… big bisous to both of you! And I think you should ask Tadpole to draw a picture of this skateboard idea of hers so you can post it here; I can’t QUITE get a visual on how that might work! haha – you just couldn’t keep it to yourself, could you? Wow! Congratulations! I finished reading the book last night and felt compelled to come here – looks like I’ll be spending the next few hours catching up on all that’s been going on with you and Tadpole and The Boy! Congratulations to all of you! I kind of wondered if that was the reason for your silence. The folic acid post got me thinking! I was given your book by a friend as a birthday present all of two weeks ago, and despite the huge pile of books I already had on my list was intrigued and quickly hooked by it – you write so well. I’ve been writing a blog for some time (though very intermittently) and so I totally understand the need for an outlet. Good luck with everything, and keep up the good work! Awesome news. Well done to you all. Goodness!! Congratulations to you and your fella!! Congratulations on your new baby-to-be! Great! Congrats to u and your family! WOW xxxx Wonderful news. So exciting for you and taddy and the Boy. I think you will end up with a football team !! Timbo, they wouldn’t want Tadpole to think she’s being replaced ;) Perhaps the new little one may be called Polliwog. Congratulations, such wonderful news. I have just finished your book which I could’nt put down absolutely loved it! hearty congrats… hope that it all works out for you. Wonderful news! Congratulations to both of you. Can’t wait to hear about Tadpole with T-2! Congratulations! Best wishes for the whole family. CONGRATULATIONS!!!! Ah, that news just made my evening. 2009 is going to be an amazing year for you. Oh how exciting. Congratulations! Can you believe that this whole blog/book started when Tadpole was so so tiny and now she’ll have a brother or sister! I wonder what blog nickname he/she will have. How very exciting. Congratulations to you both. And I am delighted to see Amazon.co.uk has a site for your new book (link below) – with a publishing date of 27 Ausgust 2009! Looking forward to it reading both the upcoming blogs and the new book…. congratulations! i’m sure tadpole will be a great big sister! Started your book a few days ago and I love it!!! My daughter is also pregnant, about two weeks ahead of you so we can compare notes as you go along. Well done Petite. Best wishes to you both. Great pictures of the marine iguanas too! Sweet news. A refreshing change from the global financial crisis. I m about to be a father too, and if everything goes well (I dare not, as you, share that news to any of my friends, but here on the internet I feel anonymously safe… Stunning paradox isn’t it!) we’ll have the baby, well I would say just on the same week as you will, as it was conceived just a few days earlier. Anyway, all the best luck to you! That is SUCH good news! Congratulations. I couldn’t be happier for you. Best wishes,and do take care during the wonderful months ahead.A very happy time. What are you going to name your tiny ‘new’ tummy visitor?Maybe Tadpole should name it. I too love ‘Muummy laid an egg’and bought it for myself years ago before I had children. Many congratulations to you, The Boy and Tadpole! Congratulations and good luck to you…you shall need it! As the young blogging mother of two little monsters (4 and 2) you shall soon realise that 1 + 1 child does not equal 2 children, but rather between 3 and 5 on a good day (and by this I mean strictly noise and damage to the home). Welcome back and what great news! Congratulations and I wish you a happy, healthy pregnancy! Hi, very many congratulations to you both. I wonder, what will you call tadpole mark 11 on your blog, when the time comes ? Hmm. Have you read ‘The Lost Child’? Interesting to read, in today’s Daily Mail, Jake Myerson’s account of his feelings of betrayal at the involuntary exposure of his life through the books and newspaper articles writen by his mother. Jake is quoted as asserting that it was in fact his mother who was gripped with a terrible addiction – writing about her children without their consent. Could be worth thinking about? Just wanted to say that I have just this minute finished reading your book. Having done that, I got onto the internet to look at your blog for the first time…and what do I see! You are expecting. Congratulations. Having enjoyed your book very much, I will now spend quite some time trawling through the blog from start to finish. Thank you for your book. I have visited Paris twice as a tourist and am very envious of you living there. The City of Lights is a very special place. Congratulations! Wonderful news for you all and loved Tadpole’s take on baby’s origins! Was just thinking today how cute would a Tadpole book be, eg Tadpole’s book of Franglais, or a child’s book from the Tadpole point of view esp with her sibling on its way. In fact I thought your 36 things about you was a great idea, maybe Tadpole could have her book of favourite Tadpole things about Paris (eg place, meal, playground, song, recipe, etc). Glad you are getting plenty of rest! Take care ps like Lionel above, I have the whole of the blog to catch up on, and thankfully a beautiful (literally) new laptop will make that possible. Et pour l’accouchement, elle a aussi des idées ta fille ? Well done, Petite. Or maybe not entirely quite so Petite, perhaps, in the fairly near future. But independent of size, we’ll love you just the same (he says, backtracking pathetically). Conception on a skateboard? That does sound adventurous. So would you be accomplishing that goofy, or regular? — now there’s a question. And we need to know the answer. Or at least we need to ask. Congratulations! I don’t envy you the light sensitive headaches though, that sounds like migraine. I hope you are not too worn out. Take care and take it easy. are all those animals in your pictures from a zoo or were they your neighbors? the one of you petting the agouti is pretty funny… he looks like he’s enjoying the attention!! Also wanted to thank you, I go on my university year abroad to France next year and fingers crossed I’ll be in Paris…my favourite place in the world! Anyway, I wanted to thank you because I had been so nervous until I found your book and now I’m just filled with excitement! that is the funniest thing I have seen all week – the drawing that is. I presume it’s Tadpole’s? Good for you both,will be interested on your take on pregnancy 2nd time around in France and if things have changed.I seem to remember that I couldn’t even remember how to hold a new born after only a 3yr interval. Keeping my fingers crossed that all goes well feeling nauseous is usually a good signBonne Continuation!! Petite, I know I’m not your “longest reader” category, but I have been reading for what seems like forever. From your tiny apartment with tadpole and subsequent moves, to being unemployed, still waiting for your court hearing to commence, and newly blossoming career and fame. So it’s not with newly shining admiration in my eyes that I tell you how happy I am for you. It is with eyes that have a softened sheen of pride in all that you’ve overcome and achieved these last years. I AM so very happy for you. HOLY SMOKES!! That is fabulous! I guess that folic acid did what it was meant to do then! This is wonderful news and I wish you, Tadpole and The Boy all the best. Like many, I came to your blog after reading your book. So much has moved on in your world since the end of it; I’m very pleased to read your news. Congratulations! 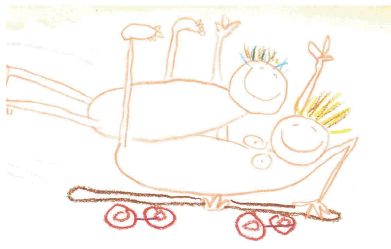 The drawing is actually part of an illustration in the book “Mummy laid an egg”. Hence Tadpole’s conclusion that the making of babies might somehow involve skateboards. I know because my own little girl has the same book, and was rather puzzled (and still is) at the various ways “mummies and daddies fit together”. And for you Petite> I’m sure you’ll be bombarded with tons of much more creative and meaningful drawings over the coming time! Hope you are feeling ok, nausea and head aches just aren’t the fun part of all this, but thankfully they are temporary. Hope the boy looks after you! Oh I am so happy for you Petite! Auguroni! Tanti Auguri! What a true delight! Many Congratulations. This is the first time I have checked your blog since reading the book. Seems the bittersweet has finally switched to sweetness, at last. Many congrats, as with all those above. What on earth are you going to call tadpole now with another on the way? Congratulations petite! I am so happy for all of you! Wonderful news. You must be so happy. Toutes mes félicitations à petite, The Boy and Tadpole! Will the new baby be Têtard? Congrats! Our two girls are now 22 and 25. It really does go that fast! This is good. Apart from the colic and teething, I mean. And now you can get the alloc’ familiales, too. I have been following your blog for a couple of years and read your book as soon as it was out in the US. I must say this is a lovely new chapter to your story. I look forward to reading about tapole #2 :)All the best! p.s. when I saw that you visited the Bay Area some months ago, I was sorry that you didn’t do a book signing. It would have been great to meet you. WOW – I haven’t read your blog in a while, as life in general just got too busy for anything not work related and what’s the first thing I see? WONDERFUL news. I’m thrilled to bits for you. Congratulations! But is noone else disturbed by that cartoon? Or is it just me?!?! Congratulations … I wish you all the luck for this second pregnancy and beyond. PS: I had a feeling baby news might be forthcoming. You mentioned taking folate in a recent blog … and as I’ve just been pregnant and on folate, it made me think! Yippee (instead of congratulations… I didn’t see a “yippee” in the other comments ; ) — I too have followed the blog for a number of years and this is a wonderful chapter to add… stay healthy, and mazeltov (no one said that either so…) — and the skateboard image is certainly quite original and different than, let’s say, a bun in the oven, hmmmm? Congratulations….and thanks for sharing the lovely photographs! I’ve gotta get out my skateboard!! congratualtions i saw my sisters post on here and had to put one on , i bet tadpole will be pleased ! congratulations! Wishing you a safe and healthy pregnancy. First of all: Congratulations! That is a very great new! I am glad for you. I read your blog because I have started to read your book 3 weeks ago, now less than 100 pages leave. I bought your book in a little bookshop in Munich because I wanted to improve my english and the book’s title took my heart. I have been living in France for 2 years and I had the same hopes about the French language and the French country. And now this book is for me the link to France. Furthermore, it is very curious this interactive way with the writers.. and to have the possibility to continue to know the story in some way. Congratulations again.. and have fun in your life! As #145, I was also awating eagerly for some baby news! I had the feeling ‘it’ wouldn’t take long, I don’t know why… Probably because it’s the continuation of your good luck these past two years and the fact that you sooooo deserve it. Many congratulations! I haven’t blogged for months, but I now have a gorgeous 4-month-old little girl and she takes a LOT of my time! I wonder if you’ll write even less – or more, because you’ll have so much more material to write about! Good luck with the nausea and tiredness – mine lasted till the 11th week, I felt very lucky (it can go on for many more, as I’m sure you know….) Did you have these symptoms when you were pregnant with Tadpole too? Toutes mes felicitations a tous. I read your book and found my way to your blog. Congrats on the new baby! I’m also a culturally transplanted mom of two. Moved from Brazil to the States (the hubby is American and I followed him here); although if I had my way I’d be living in Paris as well… you can say I was born in the wrong country and don’t quite belong to the country I moved to! I love reading about your experiences :) Keep it up! Congrats petite!! great news… another tadpole on the way. our once upon a time. First of all I want to say congratulations! I hope all goes well for you. You will have to let us know how everything progresses. I am at the mo half way through your book and i decided that i would like to read your blog so ive amazed myself that i have managed to navigated myself here, as im not the most computer literate!! Take care and im on my way up to bed here to read some more as it looks ive a lot of catching up to do! Where’s your lovely Union Jack eye gone? I miss it! Does it make you feel queasy in your bump-to-come state? Was thinking of you yesterday as we collected VAST amounts (it’s hard to snip off mid flow!) of frog spawn with the girls! It’s now doing it’s thing in a tank outside the front door! I look at it and think of your tummy – not that I think your tummy is jelly like and almost transparent in colour mind! Hugs all round to the spawning massive! Congratulations! Read this last week and was really pleased for you. Then found out that so am I. So now we can be not-so-petite together! I’ve been reading your blog for such a long time now, back when Mr Frog said he wouldn’t marry you. So much has changed in that time for you. It makes me want to move forward a bit more myself. My “baby” is now 16. God I feel old! Isn’t Babette Cole just the Best. My kids loved Mummy Laid an Egg. Almost, as much, I think as their mum did. Congrats! I loved the picture of Toadpole! What a book can do and also the creative mind! Keep up the blog while being exepecting. Always welcome at my blog! Have posted yours as one of my favourites! Love from Belgium.